It's been a year of landmark releases from Atlus for fans of some of its most loved franchises. Just recently we've seen Shin Megami Tensei IV arrive, while earlier in the year another major release came in the form of Etrian Odyssey IV: Legends of the Titan. While Atlus is often on the ball bringing these games to North America, Europe typically has to wait and hope that another publisher steps in to assist further localisation. 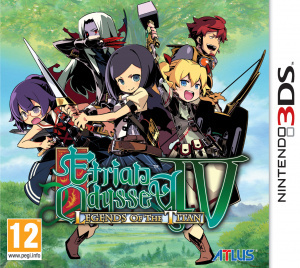 This time around NIS America Europe is stepping into partnership with Atlus to bring Etrian Odyssey IV to the region. After initially planning a Spring release and pushing it back to the Summer, the publisher has now confirmed that the title will arrive at physical retail and on the eShop on 30th August. It's also confirmed that a demo with two dungeons will be released this Summer before the full game arrives, which seems like an ideal way for newcomers to get familiar with the style of the first-person RPG series. We were big fans of this one in our Etrian Odyssey IV: Legends of the Titan review, awarding 9/10 and stating that "it's amazing how easy it is to lose yourself in it". Let us know if you're planning to pick it up below, while the launch trailer from the North America release gives a taste of what to expect. Good news although I'm not interested in the game. Nevertheless, I'll give it a shot. If I like the demo enough I just might take the dip. Now the next most important part: does the pre-order come with the gorgeous soundtrack? Me want. My retailer already had that date up for two months. I thought it was already well known. Weird. @Boukman That is weird. Last I knew NIS had said Summer, and today issued a press release revealing the date. It's a fairly generic date (retailers often speculate the end or beginning of months) so it could be coincidental, retailers were told ages ago or maybe we missed an earlier announcement! Amazing news! Despite the awful region-locking, NOE are really to be commended this year (strictly 3DS speaking of-course!). An Atlus game getting released in Europe. I must be dreaming. I'm almost been waiting ! Its a great game everyone and one of the few I actually beat this year. Clocked in over 140 hours! Looks quite good,but I have a feeling it'll be quite hard,will deffo try the demo,but I'd rather have SMTV. This is great news. Day One Purchase. Glad it's on the eShop as I'm not too sure it will make it to Australia. If it is though I will definitely be supporting the local release, if not i have the European digital release as an option. I've been waiting for this game. Unfortunately it might take me some time before I'll buy it because so many other great games are coming soon too. If it came at the same time as in America I would've probably pre-ordered it. At last! Getting this on day 1. Have had this pre-ordered for quite a while now. Sadly Pokemon will get released very soon after so I won't have time to play it until later this year. E: Not to mention the Soul Hackers, SMT4 and Bravery Default should come this year as well - all of which are infinetly more interesting games than Etrian Odyssey tbqh. Stoked that we are getting the demo as there is no other way I would consider this game unfortunately. We'll just have to see if it can do enough to stand tall amongst the miriad of fantastice 3ds releases coming this way! Yes, great news. Day one buy. Hopefully NIS America Europe will do well out of it and take up SMT4 as thier next project. There's no need for that. Nintendo themselves has taken the job quite a while ago. There's no release date yet though. That sounds vaguely familiar now that you mention it. Thank-you for reminding my aging mind. @Hunter-D lol this! I can't wait, day 1 for me. I'll download on eshop if the retail doesn't come with the sound track. SMT4 won't be released until November/December then it seems since there is no way in hell they are dumb enough to release it any where near Pokemons release. God I love the music in this game. EOIV has some of the best music I've ever heard in a video game. Glad to see this wonderful game is finally going to be playable for European ATLUS fans. So is this one coming out in Australia? My best friend is eagerly awaiting its release with anticipation. NIS America Europe. Thank-you very much. Hope to see other ATLUS titles released in the same way. You guys may get different preorder bonuses but the one we got in NA was a CD containing rough drafts of some of the music shown in the finished product. Personally I was very disappointed with the preorder bonus. There was no instruction booklet included that used to be typically packaged in the physical product. Instead the bonus is a very thin booklet of several art with the CD in it.